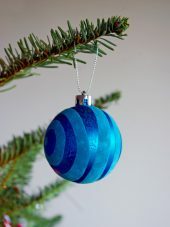 You are at:Home»Christmas in France»What are the Christmas Tree Decorations in France? 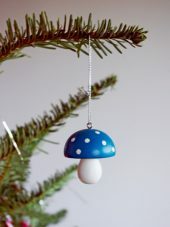 The earliest known Christmas tree ornaments were natural edible products such as apples and nuts. The red apples represented the forbidden fruit that Adam and Eve ate in the Garden of Eden (the symbol of temptation). Cookies resembling wafers symbolised redemption. 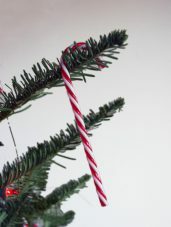 Progressively other ornaments were used such as home-made paper flowers, candies, dried cakes in the shape of characters, pine cones but also ribbons. Many first decorations were designed in the shapes of stars, hearts and flowers. In 1847 a glassblower from the town of Lauscha in the German region of Thuringen had the idea to imitate the shapes of the fruits using his glass blowing instruments. Thus he created the first glass baubles. Legend has it that eleven years later, in 1858, a severe drought led to a poor harvest with no apples and other fruits in the Northern Vosges. Consequently, there was a shortage of Christmas decorations for the tree. A glassblower from the Lorraine village of Goetzenbruck near Meisenthal thought of the same idea, that is to create glass Christmas tree ornaments. The Meisenthal glasswork is still reputed today for the quality of its products. 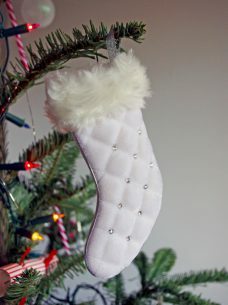 Today, there is an extensive range of ornaments that can be found in Christmas markets and department stores. The most expensive ones (and most fragile) are made of glass, while the cheapest are in plastic. 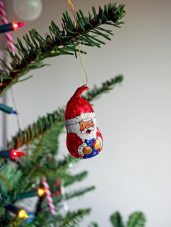 Chocolate ornaments wrapped in foil are also extremely popular in France and are hugely enjoyed by children. 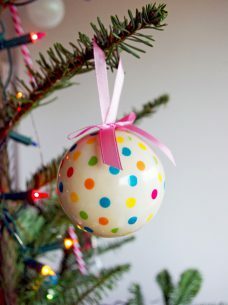 The baubles imitate the shape of the fruits that had originally been put on the tree from the 16th to the 19th centuries. In the 15th century, a very ancient decoration called ‘lametta’ was made by craftsmen in Lyon. Its metal fringes evoked angels’ hair, illuminating the fir tree with their silver or gold, inspired by the gallons worn by military men. They are called ‘cheveux d’ange‘ in French. 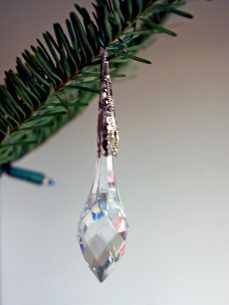 Originating in Germany in around 1610, tinsel used to be made of real silver. But as silver tarnishes over time, artificial tinsel – as we know them – later appeared. In Alsace, it is quite fashionable to decorate Christmas trees with pearl tinsel. According to tradition, 12 candles must be lit on each Christmas tree, one representing each month of the year. In Germany, between the 17th and 19th centuries, trees were illuminated by candles but the wax was too expensive, thus other techniques to create this lighting effect were found. Sometimes flexible candles were knotted around the branches or nut shells were filled with oil. 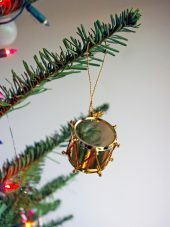 Since then, the system has evolved somewhat and iron wire or clips are used to attach decorations to trees. In order to limit the risk of fires, candles have almost entirely been replaced by fake electrical ones. Nowadays, in addition to the usual baubles and tinsel, we traditionally place a golden star on the top of the tree, symbolising the Bethlehem star. The star also represents the one which the three Wise Men followed to find the baby Jesus; the star is also a symbol of light. 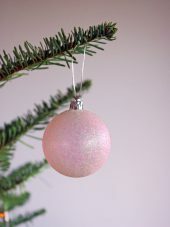 Alternatively, French Christmas trees can sometimes be topped with a ‘cimier oriental‘ or ‘pic‘ (finial) or an angel. Did you know? You can also read this article in French on our blog Mon Grand-Est! The position of a Christmas tree in a room needs to be carefully considered. It needs to stand in a stable place, where it won’t be brushed against by passing people. It is essential to ensure it is not placed too close to a source of heat and to be extra careful if you intend to use real candles to decorate it. The lights should be arranged on the branches near the base of the tree. Weave strings of lights along the branches towards the inside of the tree then move back to the outer edges of the branches and upwards. 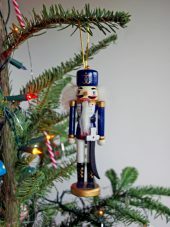 Try to avoid hanging your ornaments right on the tips of the branches as they may fall, due to their weight. Placing ornaments and other decorations ‘inside’ your tree (that is, towards the inside of the branches) add depth and make it ravishing. Place your ornaments without too much order and symmetry, and arrange them evenly around the tree, varying their shapes and colours. 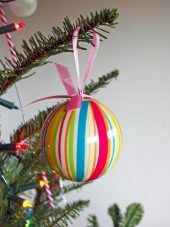 The larger ornaments should be placed towards the bottom, the smaller towards the top. A tasteful tree is generally not multi-coloured. Limit your main decoration colours to just two or three: it could be a mix of gold, green and red (the traditional colours of Christmas), pink and gold or blue and silver, for example. If you believe tinsel adds an unnecessary weight or thickness to your tree, you can always adopt the Alsatian/German tradition and replace it with ‘Cheveux d’Ange’. Next Article Have a Merry Mild Christmas in Paris!